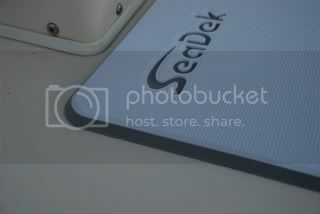 SeaDek comes in a varitey of different thicknesses. This is nice because it allows you to custom tailor a pad to your needs and application. Our 3mm foam is the thinnest sheets avaliable. If you are looking only for traction a 3mm pad may suit your needs. The 3mm works great for knife cutting do-it yourself projects. It is to thin to be routed on our CNC machine for custom applications so a knife cut edge is the only option. The next step up in thickness is our 5mm sheets. The 5mm sheets are kind of a standard and what have been around since the beginning. Having the extra thickness provides not only traction, but added comfort as well. Anything that is 5mm or thicker can be routed on the CNC machines giving the pad a nice beveled edge and adding a more finished look to any project. The next step up is our 10mm sheets. Once you move up to a 10mm pad or thicker you are most likely looking at a thickness for something like a helm pad which provides extra cushioning. The great thing about SeaDek is all of these different thicknesses can be laminated together to give you even more options in thickness. Laminating two different colors of foam together also allow the contrast needed to create logos in the pads while giving the pad a two tone border which really sets it off. For example you can laminate a 3mm piece of Storm Gray foam over 3mm Midnight Black to give you a 6mm piece of foam. Take a look at the picture below to see what a nice look 6mm foam can provide. For a helm pad for a larger center console boat, we use 13mm or 15mm. I try to us a combination of 3mm foam as the top layer on any pads with logos so the routed logos stay fairly shallow in depth. Stock SeaDek helm pads consist of a 15mm foam. Take a look at the picture below to see 5mm White laminated over 10mm Storm Gray in a stock helm pad.